For the construction of wooden floors, which are based on lags, there are several technological variations. The choice of flooring flooring scheme depends on the building structure, the climatic conditions of its location, the type of foundation, the geological properties of the soil under the object (for individual construction), etc. Layout of the flooring on the logs. The board flooring is made for floors in apartments with their organic combination with the general interior and decorative design. The board is also used for arranging the subfloor for other finishing coatings. But with any options for the flooring of the board floor on the logs, the basic installation techniques are generally accepted. The floor construction on the logs allows the installation of the coating on an uneven base with the help of linings under the bars of plywood fragments or thin dies. Horizontal lag can be achieved using threaded fixtures to level them. Such a floor device allows laying various communications under the floor covering. But this installation option is suitable for rooms with high enough ceilings, since the construction requires 7-10 cm of additional space. Stages of installation of plank floors in lags. Boarding directly on the logs can be done in almost any room without moisture. Installation is performed after completion of work with aqueous solutions and mixtures. If a concrete screed was used, it should dry out within a month. For residential premises, the material for logs may be pine, spruce or fir. Wood used 2 and 3 varieties with a moisture content of not more than 20%. Bars choose with dimensions in section in the ratio of 2 * 1.5. 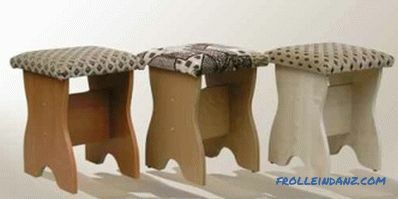 Material parameters are taken based on the upcoming load on the floor and, accordingly, the thickness of the board used. Lag docking options: end-to-end ends and cutting in the wood floor. The dimensions of the cross section lag depend on the chosen span between them and are received with a margin. 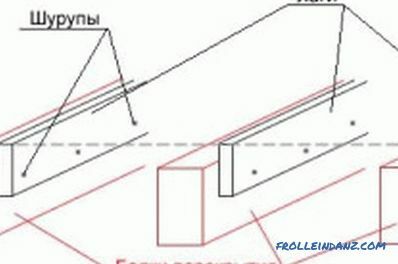 The span between the lags for laying boards with a thickness of 30-40 mm is taken 80 cm. 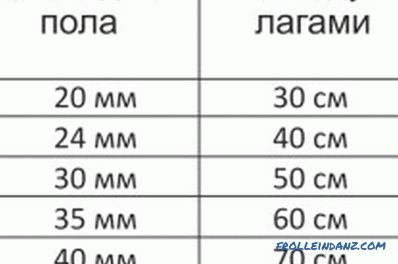 For thinner flooring (up to 30 mm) the spacing between the bars is maintained 50-60 cm. Most often logs are 100-120 mm as lag height. Sometimes matched boards are used according to the accepted size, sewn together in pairs and mounted on the edge. When calculating the height of the beam takes into account the thickness of the insulation material being laid between the lags. A ventilation gap of 2-3 cm should remain between the insulation and the finishing coating. The wood must be acclimatized to the conditions of the room. Bars and planks must be kept indoors for at least 7 days. Before installation, all wood materials are covered with refractory compounds and bio-impregnation. The board is soaked from the back facing the base. Softwood is more commonly used as a material for boardwalk, but maple, ash, and oak are also used. For flooring bedrooms choose boards from alder or aspen, these types of wood are considered beneficial to health. If you are planning to varnish the floor, preference should be given to choosing a dense wood of light colors with a pronounced natural pattern and gloss. The material from the high price segment, walnut and mahogany, has an exquisite look in color and texture. Cheaper at cost oak with recognized decorative qualities. For the device of the floor covering, boards with a tongue-and-groove connection are used. The most common material is 28 mm thick. For rooms with a heavy load on the floor, floorboards with a thickness of 36 mm are used. Board width can be from 68 to 138 mm. with a lath into the tongue. In the manufacture of the material on the bottom of each element, a product (2 mm) is chosen for ventilation when installing two-layer coatings. At the edge of the front surface of the board, a special bevel is made on the side of the groove for more densely joining the floor elements during installation. Waterproofing is always laid on the base before installing the floor along the logs. Used polyethylene with a thickness of 0.2 mm or penofol. 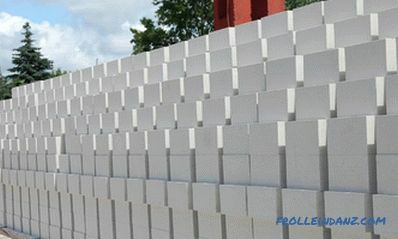 Penofol also performs noise absorbing functions. Perhaps the use of roofing material. The lags under the plank floor, regardless of the type of base and design features, must be thoroughly fixed, and their upper faces lie in the same plane. 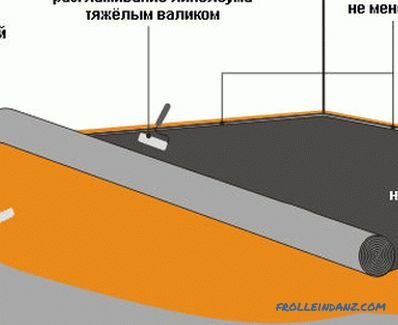 With the help of a hydraulic level, the marks of the location of the base for the plank floor can be applied on the walls. According to them, using a nylon cord and spirit level, put two lags in opposite walls. 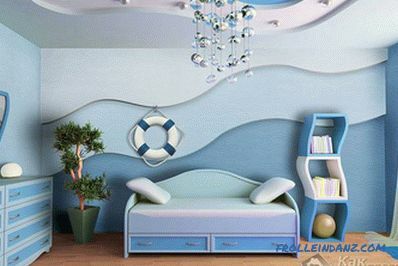 From the wall is indented 15-20 mm for air circulation. According to the level of the extreme lag, the rest are set. The direction of the mounted bars should be across the main stream of light from the windows. In narrow rooms - across the direction of travel on them. 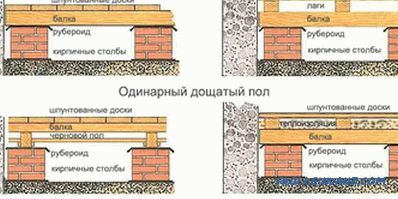 The ways of fastening wooden lags to various underground structures are various. Practiced and complete rejection of the fixation of the bars to the concrete surface of the ceiling. 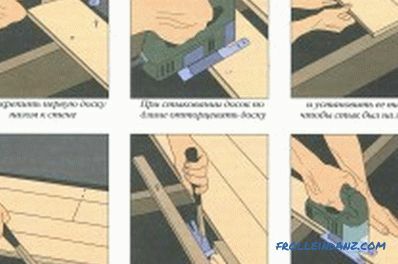 The strength of the assembly is achieved due to the reliability of fastening the flooring of the boards. 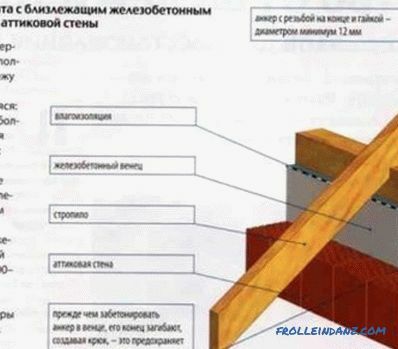 But in this case there is a risk of shear bars when installing the coating. 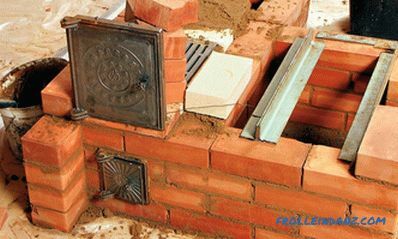 Therefore, it is safer to use anchors or dowels for rigid installation of lag on the base. Holes are drilled symmetrically in a timber and in a concrete floor. Polypropylene plugs or steel anchor sleeves are inserted into the nests in the concrete. Fastening is done by selected screws or bolts. 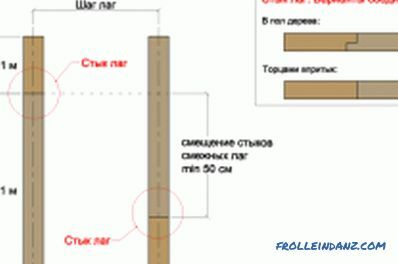 One timber is fixed with 3-4 anchors or dowels through 60-80 cm. 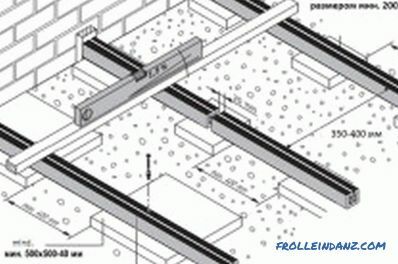 If the length of the bars is not enough from wall to wall, they are installed end-to-end. With the expected high load on the coating end face files are performed for splicing elements. To enhance the rigidity and durability of the frame bars under the coating, they are fastened together with transverse elements with the help of corners 4 * 4 cm. Between the lags mounted on the ground, the insulation is installed only on the pre-mounted draft floor. 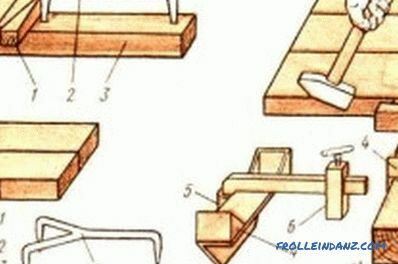 Clamps for joining floor boards: a - building bracket, b - compress - clamp, in - compress wedge with movable bracket; 1 - wedge, 2 - bracket, 3 - lag, 4 - wedge compress, 5 - spur, 6 - movable stop. The floor boards are laid along the logs perpendicular to the bars and are joined by a crest into the groove. The first board is set with a comb to the wall at a distance of 1 cm from it. Having retreated 3 cm from the wall, 2 screws are screwed in at the joints with bars on top of the board. Hats utaplivayutsya, they will be under the plinth. The subsequent boards are attached to the lags by screwing in the screws at a 45 ° angle into the groove with the insertion of the caps. 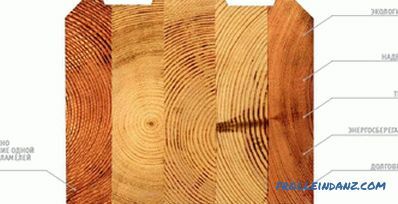 Regardless of the type of boards used, the annual rings of adjacent floorboards should have different directions. Due to such a device, the coating reduces the risk of warping the floorboards in the future. Butts before fastening the boards are hammered through a small bar. For more dense rallying of boards in a bar the bracket is hammered. The seal is made by driving a wedge between the bracket and the extreme board. To fix the last row of the cover, the boards are cut to the desired width, taking into account the ventilation joint, and fixed by wedging from the wall. The row is fixed in the same way as the first, then the wedges are removed. It is better to fix the boards to the logs at the end of the heating season so that the wood can dry out well. During the summer period there is an intensive absorption of moisture by the tree. After installation, during the winter, floorboards can crack and gaps form between them. If it is necessary to equip the plank floor in the summer, it is better to perform work after a long hot period. Due to the shrinkage of the coating during operation, temporary installation of the plank floor is applied to the logs. Boards are laid face down and fasten only every five rows. Missing rows are recorded only by docking and compression. After a period of shrinkage (about a year), the coating is dismantled and stacked using standard technology. Many people find this method inconvenient, but such a repair greatly increases the service life of the coating. Instructions for mounting the power plate.Fastening with anchor bolts, wire and pins. Features mounting Mauerlat. Necessary for fixing the power plate tool.